In the current world, one of the main problems in medicine is treating patients with cancers. Cancer presents a special challenge to both scientist and physician because the causes of pathogenic mechanism that result in this disease currently are unknown. Research has been able to identify many risk factors (many having an intimate relationship with the development of cancer) and several possible pathogenic mechanisms, but the complete etiologic causes have not been identified and/or understood. Adding to the challenge of treating malignant processes is the great variety of cancers. Cancers can develop from many histological structures present in the body, ranging from brain tissue to gastric tissue. Each type of cancer has its own pathogenic mechanism and underlying causes. Therefore, discovering the cause of one type of cancer will only provide insight into the cause of other cancer. A special group of cancer syndromes includes the hematologic cancers, which include leukemia. Leukemia is a special type of cancer derived from the hematopoietic system found in bone marrow. Leukemia can also later be further classified according to the cells they produce, adding more layers of complexity to our current understanding. Leukemia, like many other diseases have distinct characteristics which define it and distinguish from another disease. For example, contrasting with many cancers, leukemia does not present initially as a tumor in a specific area. In contrast, it manifests as an alteration of the hematopoietic process. Another characteristic of leukemia is its frequency in children. This might be why leukemia has gather attention in the past years. This can also be attributed to campaigns seeking to raise awareness about that disease and knowledge about it as well. These campaigns mainly seek to increase knowledge and awareness by describing and explaining to the general audience what is leukemia. Diseases, like leukemia, are usually defined according to the epidemiology, the pathogenesis, consequences and classification of the disease. One of the main task in when describing a disease, is observing the statistical association across the populations or its epidemiology. Leukemia is the 10th most common type of cancers and represents a 3% of all new cancers. It is one of the most common childhood cancers. However, most cases occur in older adults between the ages of 65 to 74 years old. Also, leukemia is slightly more common in men than women. But one of the most important aspects of its epidemiology is the yearly reported new cases and the estimated deaths. When comparing these two statistics leukemia stands out due to the cases of death. For example, in the United States of America, 60,140 new cases were identified in 2016 and in the same year 24,000 died of the diseases. This is sometimes quite shocking as other cancers (with the exception of lung cancer) do not cause as many deaths when compared to the new cases in the same year. While leukemia has almost 1 death to 2 new cases ratios, other cancers such as thyroid cancer, kidney cancer, and prostate cancer produce much more cases or much fewer deaths in the same year. However, to perform adequate epidemiological studies a disease must also be defined according to the pathogenesis, and consequences of the development of the disease. This allows the disease to distinguish from another disease that might share similar pathogenic mechanism and consequences. Leukemia is not the exception to this. As previously stated leukemia is a type of cancer which derives from cells in the hematologic system. Often, in cancer, the tissue from which the malignant cells are derived will determine some of the behaviors of cancer but some behaviors are common to all cancerous cells. Leukemia¸ as malignant disease demonstrate cancer cell behavior. These are summarized by Hanahan and Weinberg when proposed the hallmarks of cancer in the year 2000. The original hallmarks of cancer are sustaining proliferative signaling, evading growth suppressors, resisting cell death, enabling replicative immortality, inducing angiogenesis, and activating invasion and metastasis. However, recently more hallmarks have been proposed and some features described as enabling characteristics are also currently being proposed. The emerging hallmarks of cancer are the deregulation of cellular energetics and evasion of the immune systems. The enabling characteristics are genomic instability and tumor-generating inflammation. Both, the emerging hallmarks and the enabling characteristics, were proposed by Hanahan and Weinberg in the year 2011. Inleukemia¸ as we will see further ahead¸ sustaining proliferative signaling, the dysregulation of energetics, and the evasion of growth suppressors are particularly influential. Once these appear in certain cells of the hematologic system, hematologic cancers can manifest themselves. But leukemia is not the only type of cancer of the hematologic system. In order to define leukemia, it is fundamental to understand how it is different from another disease. Lymphomas are another type of hematologic cancer which share some characteristics. But their differences rely on the population of cells from which each cancer originates. While leukemia, originates from the hematopoietic cells subgroup, lymphomas originate from lymphocytes. However due to recent studies there is a leukemia subgroup, chronic lymphocytic leukemia which is now considered to be a type of lymphoma. This result of the identification of similarities between chronic lymphocytic leukemia and a type of lymphoma called small lymphocytic lymphoma. Even though this shows that a degree of overlapping characteristics exists, the differences observed in the histological origin and clinical outcomes remain and allow to distinguish leukemia from lymphomas. Leukemia also needs to be differentiated from non-malignant myeloproliferative syndromes. In both leukemia and myeloproliferative syndromes there is a pathological increase in the proliferation of blood cells. Myeloproliferative syndromes are a group of conditions composed of polycythemia vera, essential thrombocythemia, idiopathic myelofibrosis, and chronic myelogenous leukemia. This group contains one type of leukemia, suggesting common pathogenic pathways in the development of the disease. Nevertheless, in non-malignant proliferation there is no cytogenetic abnormality in the cells. They are simply processes in which proliferation increases without causing cancerous changes in cells. Meanwhile, in the only malignant condition of the 4 myeloproliferative syndromes there are abnormalities in cells. 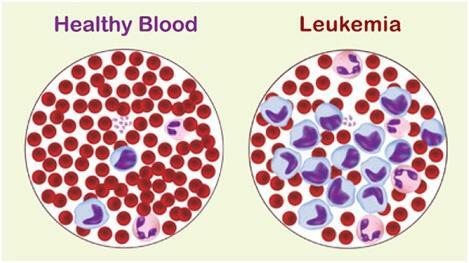 Abnormalities similar to those found in the other types of leukemia. When discussing what is leukemia, it also essential to point out the different types of leukemia. These groups affect particular age groups, signs and other changes in particular that make it different from the other groups Traditionally, four main groups were described acute lymphoblastic leukemia, acute myelogenous leukemia, chronic lymphocytic leukemia, and chronic myelogenous leukemia. However, because chronic lymphocytic leukemia is now considered a lymphoma, only the other three will be considered. Chronic myelogenous leukemia, was previously mentioned that it is also a myeloproliferative syndrome with cytogenetical abnormalities not present in the other myeloproliferative syndromes. The most commoncytogenetic abnormality found in this disease is the Philadelphia chromosome. The Philadelphia chromosome is the result of a reciprocal translocation between chromosomes 9 and 22. As result, often the BCR gene and the ABL gene fuse, forming a protein with increased tyrosine kinase activity. This activity is associated to some of the hallmarks of cancer including, avoiding apoptosis and stimulating uncontrollably proliferative signals. Chronic myelogenous leukemia has both clinical and laboratory distinguishing characteristics. Both clinical and laboratories characteristics in general will vary on the phase of the disease. Other characteristics such as the presence of the Philadelphia chromosome will manifest throughout the disease. In about 90% of patients with chronic myelogenous leukemia, the Philadelphia chromosome can be identified through routine cytogenetic testing. In most the other 10%, the Philadelphia chromosome can be identified through other studies such as fluorescent in situ hybridization or reverse-transcription-polymerase chain reaction. Another type of leukemia is acute myelogenous leukemia, an aggressive disorder hematologic cancer. In most cases, no cause is identified but many risk factors have been identified. Diseases such as Down syndrome, Fanconi anemias, Bloom syndrome and ataxia telangiectasia have a higher risk of developing acute myelogenous leukemia. Other factors that raise the risk of cancer are, being subjected to a splenectomy, to alkylating agents and benzene or ionizing radiation. Alkylating agents are a common cause of acute myelogenous leukemia. It rarely manifests in children, being most frequently diagnosed during the ages of 60 to 70. Contrasting with chronic myelogenous leukemia, symptoms appear quickly in a period of days or weeks. Common symptoms associated with chronic myelogenous leukemia are associated to defective hematopoiesis. Because the hematopoietic system is creating cancer cells, the production of red blood cells, neutrophils, and other cells are deficient in their blood concentration. Anemic symptoms, such as fatigue, shortness of breath, dyspnea on exertion and paleness are observed. Additionally, frequently major infections are present (around 30% of patients are also diagnosed with cellulitis, pneumonia or septicemia) along with coagulation deficiencies. Just as other cancers have many subtypes, acute myelogenous leukemiais also subdivided into further groups. There are multiple classifications but the most commonly used are the French-American-British Classification and the World Health Organization Classification. In particular, the first is quite simple to use. The French-America-British Classification of Acute Myelogenous Leukemia includes 8 categories. They are classified according to the type of cell produced by cancer. The most common types are the M1 (myeloid with no maturation) with about 15-20% and the M2 (myeloid with maturation) with about 25-30%. These two types, along with M3 (promyelocytic with 10% of cases) and M4 (myelomonocytic with 15%) represent the majority and those with the best prognosis. The rest, M0 (undifferentiated), M5 (monoblastic), M6 (erythroleukemia) and M7 (Megakaryoblastic), do not have a good prognosis. Prognosis is also dependent on the technology the physician disposes of because as new pharmacological agents are made, patient outcome improves. Improvement in the prognosis has also been seen in another type of leukemia, acute lymphoblastic leukemia. This type of leukemia carries many similarities to the others but will also have it particular epidemiology and biology. It is relatively infrequent when compared to acute myelogenous leukemia and its age distribution features a bimodal peak. In the bimodal peak it can be observed that most cases are diagnosed in children but later at the age of 60, another peak occurs. Its clinical manifestations will resemble acute myelogenous leukemia but in addition it will frequently present enlarged lymph nodes and swelling of the spleen or the liver. A classification within, acute lymphoblastic leukemias was also created by the French-American-British group. Because acute leukemias will not produce mature final stage blood cells, all products of an acute lymphoblastic leukemia will produce only lymphoid cells. Therefore, rather than describing the lineage like in other classification, the morphological features will be described and used to distinguish the three groups. Leukemia, like many other cancers¸ is distinguished from other cancer through by considering many aspects. But the most essential is the histological origin of the cancerous cells. For leukemia it is the hematopoietic tissues. From these a great diversity of cell types can be derived and accumulate in the circulation. 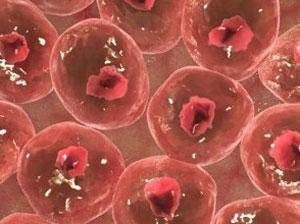 However, within the hematopoietic system there are numerous cell types which produce the circulating blood cells and numerous types of cells produced from these cells. This in turn will allow the classification of leukemia into three categories and later the classification of each of these groups into smaller subgroups. An essential part of defining what are leukemias because regardless of the numerous groups there will be common features in all of them. Leukemia is a category of hematological cancers defined by the cells is generated from and the cells produced. These characteristics have only been defined as technology permits the physician and scientist to identify the cell by cytomorphological, cytochemistry, immunological, and molecular markers. All of these markers have allowed the physician to describe what leukemia is in greater detail and without only relying on clinical aspects. These descriptions have led to the development of better treatment option and choices from clinicians. The progress that has been made in the management of leukemia must be the basis for more research to be done. Particularly, research into the etiology of leukemia is needed. Because there are numerous types of leukemias, this will not be an easy task because each type will require an individual description of the possible causes. Regardless of how tedious they are, the results of this research might yield future therapies which might help to save numerous lives.